Although the original idli itself is quite nutritious, this innovative version is even more wholesome and filling. 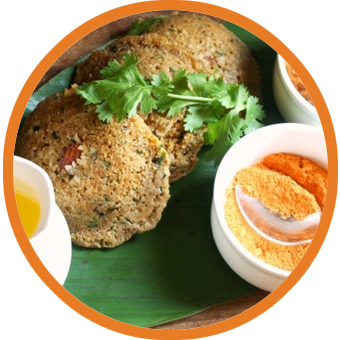 Oats idli replaces rice with oats, to help reduce the fat content and keep cholesterol levels in check. You can also add some boiled veggies to the batter to enhance the fibre content further. These idlis can be prepared any time, since the batter does not require to be fermented. However, this also means that the idlis will not rise when cooked, so don’t worry when you see a flat outcome. Enjoy these idlis fresh and hot with green chutney and sambhar. 1. Combine the oats and urad dal and blend in a mixer to a smooth powder. 2. Add 1½ cups of water, salt and green chilli paste and mix well to make a batter of pouring consistency. 3. Cover and keep aside to ferment for 1 hour. 4. Grease the idli moulds using oil and put spoonfuls of batter into them. 5. Steam in an idli steamer for 8 to 10 minutes or till they are cooked. 6. Serve immediately with sambhar.